How can you go wrong with shades of pinks and reds? I stamped and black embossed the Cosmos Flourish on Watercolor Paper, then colored using the Reinker Wash Technique from TJNL CD#7. 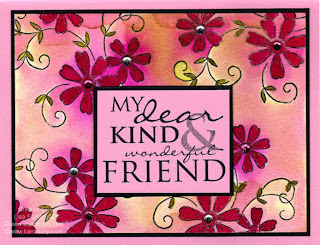 The sentiment is stamped in Black on Pink card stock then to a Black panel and to the base card with dimensionals. For some added Bling, I used the Hot Fix Rhinestone Applicator from Kandi Corp to adhere some crystals. Stamps - Kandi Corp Cosmos Flourish, Sentiment Stampin' Up! What a striking background, Lisa! I love the colors! This is gorgeous. I really love that saying up front and i used it often. Beautiful work as always Lisa.